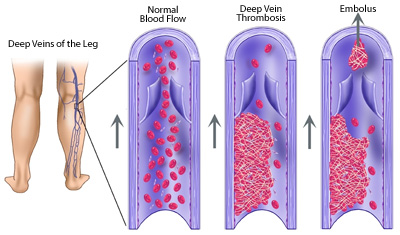 Deep Vein thrombosis (DVT) is a pathological state in which the thrombus (blood clot) has been formed in the deep vein. Commonly affected are the leg veins (popliteal and femoral), though occasionally thrombus can be found in the pelvic area or arm veins. leg fatigue and engorgement of the superficial veins. Risk factors for developing DVT are long immobility after surgery or hospitalization, obesity, estrogen based contraception, air travel (hence the nickname of “economy class syndrome”), recent cancer treatment, previous episodes of DVT etc. Complications of DVT are: Pulmonary Embolism (PE), postphlebitic syndrome and chronic venous insufficiency. Upon diagnosis of DVT, anticoagulant therapy (usually heparin then long term warfarin or other vitamin-K inhibitor) is started in order to prevent further formation of thrombi. Thrombolysis is an interventional procedure aimed at dissolving of the formed thrombus within the vein. This procedure is performed by an interventional radiologist who inserts the cathether under imaging guidance (usually in the popliteal vein – located at the back of the knee) and leads it to the exact location of the thrombus. The tip of the catheter is positioned into the thrombus and the thrombolytic drug is released. Thrombolitic medication dissolves the clot, preventing possible pulmonary embolism and establishing more regular blood flow in the affected vein. Thrombolysis is the most effective when performed soon after the diagnosis has been made, usually up to 10 days. The best result is achieved with the recently formed thrombi.